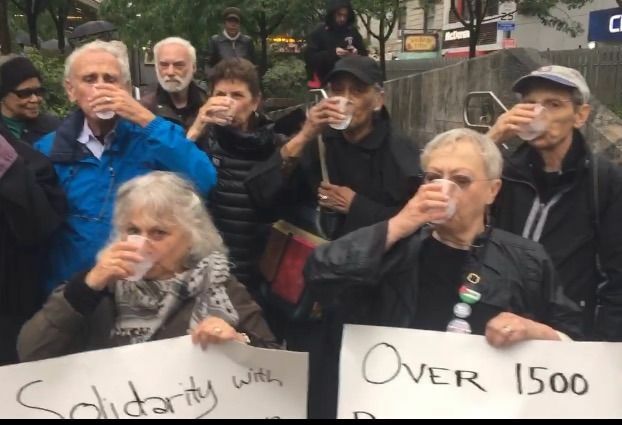 NYC Protestors Drink Salt Water In Solidarity With Palestinian Hunger Strikers | Jews Say No: Not In Our Name! 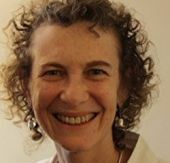 Donna Nevel is a community psychologist, educator, and founding member of the Facing the Nakba project, Jews Say No!, and the Network Against Islamophobia, and was a co-founder of Jews for Racial and Economic Justice. Jews Say No!, an NYC group I am a part of, and the Grannies Peace Brigade recently participated in the salt water challenge in solidarity with more than 1500 Palestinian hunger strikers, who have entered the 38th day of their strike. The Palestinian prisoners in Israeli jails began the hunger strike on April 17th, and the salt water challenge, a social media campaign to show solidarity with the strikers, began with a call by the son of imprisoned Palestinian leader, Marwan Barghouti. Thousands of individuals and groups have taken the salt water challenge across the globe in support of the Palestinian prisoners. Numbers of the mothers of the prisoners have also courageously joined the strike in solidarity with their sons. Palestinians have held rallies and called a general strike across the West Bank in support; South African anti-apartheid leaders went on a solidarity strike; and students in the U.S. called for a one day fast in solidarity with the prisoners. Support for the prisoners is widespread. The Israeli government has not only failed to respond adequately, but prisoners have been subjected to harsh treatment and retaliatory measures. As a result, the strike has continued and numbers of prisoners have been taken to medical facilities because of seriously deteriorating health. Where is American Jewish community support for the Palestinian prisoners? Where is the call from American Jewish organizations to Israel’s leaders demanding they honor the call from the prisoners for their basic needs and rights. The Israeli government’s appalling treatment of Palestinian prisoners is well-documented. There is simply no rationale for not supporting the rights of the Palestinian prisoners. The demands of the hunger strikers will hopefully be met soon, but we know that international pressure and support can be critical at moments like this. This is a challenge to the American Jewish community to make our voices heard loud and clear in support of the Palestinian hunger strikers, whose demands are simply a call for dignity and humane treatment. This entry was posted on May 25, 2017 at 2:00 pm and is filed under articles, Events, Israel, Published online, Solidarity Statements. You can follow any responses to this entry through the RSS 2.0 feed. Both comments and pings are currently closed.